Instead of relying on greasy fast food or going to the same deli you visit every day, consider making a bento box to take with you instead. Having lunch on the go can be a challenge. After all, you want to be sure that you get enough to stay full until it’s time for dinner, but you don’t want to be so full that you fall asleep at your desk. Instead of relying on greasy fast food or going to the same deli you visit every day, consider making a bento box to take with you instead. Here are some suggestions for what to put in it. You would probably associate this fried egg omelet with breakfast or brunch, but it’s also a tasty addition to your bento box. 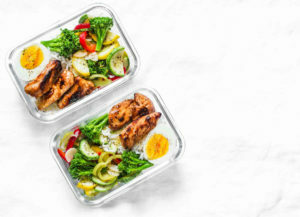 It’s easy to make, and unlike a regular serving of eggs, you can still eat it when it is at room temperature, which means that it’s an excellent idea for a bento box, especially since eggs are at their best when they are hot and fresh off the stove and not reheated. You might have seen donuts substituted for these treats in animated shows that you watched growing up, but you might not realize that they are made with rice and dried seaweed similar to sushi. Called onigiri in its homeland, you can enjoy these in your bento box as well. Even though they are typically round or triangular once they are rolled up, you can easily make them resemble adorable animals such as pandas or cats. Commonly known as “brown bag sushi,” this dish is made by wrapping sushi up inside pouches of fried tofu. Think of it as a Japanese spin on a burrito! It doesn’t leave a ton of mess behind, and the tofu skins can be dyed many different colors to give your lunch a fun touch that it might not have otherwise. Teriyaki chicken is always delicious, whether or not you skewer it on a stick. The chicken is doused in a sauce that is sweet and salty at the same time. Whether you want to eat it hot or cold, it is still just as flavorful. Typically you could include as much as you want in your bento box, but don’t feel bad if you have leftovers! That’s even better! That’s because you now have something set aside for dinner, and if you’re not in the mood for it later the same day, then you can take whatever you have left and use it as one of the building blocks for your next bento box! Lotte Plaza Market is your one-stop shop for all of your Korean and Asian grocery needs. With more than 10 locations in Maryland and Virginia, this growing market is always expanding and opening new markets to serve our customers better. Since we opened in 1976, our goal has always been to provide the best customer service and groceries to our customers. For answers to all of your questions, please email us at LottePlaza.com. This entry was posted on Friday, April 12th, 2019 at 11:20 am . You can follow any responses to this entry through the RSS 2.0 feed. Both comments and pings are currently closed.